Why is it so HARD to sell art online? Selling and Buying art is hard. Buying art is a highly visual process. Holds true both online and off. This is why you, artist all struggling to get some real sales going. Unfortunately, the way that artists are trying to sell art online is designed to fail. Because in order to sell art online, you need an eStore that is designed to sell art and nothing else or use sites like Saatchi, Artfinder etc.. This is really important, so let me explain. Before we do… What size is the online art market anyway? Not only is the market HUGE, but online sales are reshaping the art business. According to the BBC, more art is now sold online than in galleries. The stereotype of younger people being more tech-savvy is, according to Hiscox, simply not true. Most art buyers aged over 65 had bought art directly online. What if you only offer original art? Or limited editions? Are those selling online too? 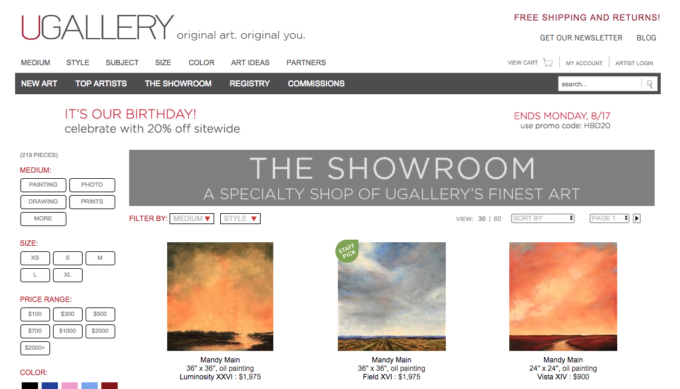 UGallery.com, Saatchi.com, Artfinder.com are few examples of a websites completely dedicated to selling original art. Saatchi charge Artist's almost 50%+ in Commission. .
Artfinder and Ugallery around 30%-35% in Commission. .
Justpaintings proposed model is around 15%. A simple Google search for “buy original art” reveals an increasingly-crowded field of companies moving quickly to capture market share in this space. Clearly the online art market is both large, growing, and an opportunity for all artists to capitalize on. Which takes us back to why you need an eStore that is actually designed to sell art and nothing else. A pretty portfolio site doesn’t work. Don’t take our word for it. Ask the tens of thousands of artists who have these sites right now and sell next to nothing. Neither does a generic, one-size-fits-all eCommerce store. …so they just didn’t buy. Meanwhile…individual artists are finding it harder and harder to make sales. They’ve brought sticks and stones to a gunfight. It’s affecting their sales both online and offline. Justpaintings is an Enterprise Class Ecommerce platform designed from the ground up for artists. It starts by giving you a beautiful website to display your work. Then we add in state of the art ecommerce technology that will have you not just playing with the big boys, but beating them. We follow that up with a suite of tools, promotion through social media that will help you both acquire and retain customers. All of which we are excited to show you on your demo. Everyday our team of curators comes to work focused on one thing. Getting better at selling art. It’s more than just a name; it’s our mission & commitment. Every day, we study the competition. We are your eyes and ears on the ground. We get feedback from art collectors, buyers and artists everyday and we get more ideas. We also call, email, and poll our community of artists. We find out what’s working, what’s not, and we get ideas. We take these ideas and we run tests. The losing ideas get dropped, the winners, they get implemented immediately. Which means every day, you get better without lifting a finger. Our commitment to you is that we WILL NOT STOP testing and improving.